Rock Island Arsenal switches to renewables: The government’s cheap, easy way to make its power clean. The Defense Department and other agencies have found an easy way to cut emissions and save energy. Now they need to do it a lot more. The Pentagon just announced a contract with a big-time defense contract that good-government and energy-efficiency types should cheer. Illustration by Sofya Levina. Images by alienant/Shutterstock and Melissa Held/Shutterstock. Big defense contracts awarded to big defense contractors are usually a big cause for concern. They tend to go over budget, often for things we don’t really need (like a certain type of fighter plane). 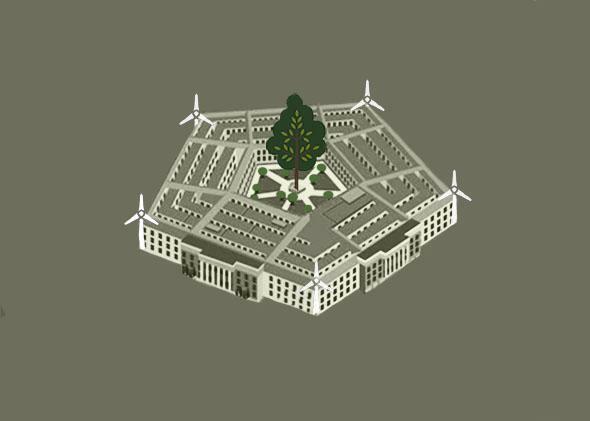 But a couple weeks ago, the Pentagon announced a contract with a big-time defense contractor that good-government and energy-efficiency types should cheer—and demand grow more common. Honeywell Building Solutions, a unit of the conglomerate Honeywell, got a $22.4 million contract to overhaul the energy system at Rock Island Arsenal—an ancient military outpost on an island in the Mississippi River between Iowa and Illinois. A tad boring? Maybe. But it’s an example of how the private sector can easily and cheaply be harnessed to work for the public interest, all while saving energy and cutting emissions. Because they own so much property and consume so much energy, government agencies have a great deal to gain from upgrading their equipment with renewable technology. But in this era of sequesters, the Pentagon and its sister agencies can’t afford to buy new boilers, air conditioners, efficient light bulbs, and hybrid trucks—even though they would pay off relatively quickly in the form of lower operating costs. Under a type of contracting that is growing increasingly popular, however, companies offer to install the new equipment while guaranteeing energy and monetary savings—all for no money down. The trend toward what’s known as guaranteed performance contracting started more than 30 years ago, propelled in part by Shirley Hansen’s book Schoolhouse in the Red, about maintenance issues in the educational sector. In this model, a financial institution fronts the money to do the upgrades. The contractor guarantees the work it does will produce a certain amount of savings, thus capping or even reducing the government entity’s annual energy bill. The government repays the bill for the upgrades over time (10 years, 15 years, 20 years) simply by making payments that are the same—or lower—than its existing energy bills. Efforts to make the federal government run more and more on sustainable energy have intensified in the last few years. A 2007 executive order by President George W. Bush called for federal facilities to reduce energy consumption by 30 percent by 2015. And in 2011, President Obama announced a $2 billion commitment to help federal buildings pursue energy savings through so-called Energy Savings Performance Contracts, a form of guaranteed performance contracting. (Here’s a good Energy Department primer on ESPCs.) In response, many agencies, including the Defense Department, set up programs to qualify private-sector firms to carry out projects. “A tremendous boost in the market came when Obama put out [the] executive challenge,” says Kevin Madden, the vice president of worldwide sales at Honeywell Buildings Solutions. His company is one of 16 firms that have qualified for Energy Department work and one of 14 that has done so for Army contracts. ESPCs can be a great way to upgrade old infrastructure. And there’s not much public infrastructure in the U.S. that is older than the Rock Island Arsenal, which has produced ammunition and guns since the 19th century. (It also housed Confederate prisoners during the Civil War and is where Ashley Wilkes was held in Gone With the Wind.) Today, Rock Island continues to function as a garrison, and as a vital cog in the manufacturing of war material, with more than 7,500 employees. While Rock Island’s power systems don’t date to the 19th century, they are quite old and inefficient. So in May, Honeywell and the U.S. Army announced their deal, under which Honeywell will dismantle the garrison’s mid-20th-century coal-fired steam plant and install new natural gas boilers in more than two dozen buildings. In addition to cutting water use by 12 percent and slashing energy consumption by 11 percent, the move will help the installation comply with stricter emissions regulations by swapping coal for cleaner-burning natural gas. “With this project, we’ll reduce our operating costs significantly while also lowering our environmental impact by eliminating our reliance on coal as a heating source,” Col. Elmer Speights Jr., commander of the Rock Island Arsenal Garrison, said in a press release. Honeywell will get $22.4 million from a lender to do the work, and the government will pay back those funds over a 15-year period by making payments that are equal to or lower than what it costs to run the steam plant. That’s not the only work Honeywell is doing for the Army on Rock Island. Last year, in January, the two parties agreed a $61 million deal to upgrade the systems at Rock Island Arsenal Joint Manufacturing Technology Center, the arms factory that accounts for about two-thirds of Rock Island’s overall energy use. Under a 20-year ESPC, Honeywell will install new heating and air-conditioning systems, as well as put in equipment that will make the painting systems more efficient. Says Madden: “When we combine all the work we’re doing, electricity use at Rock Island will be down 35 percent, and water consumption will be down 30 percent.” The parties say the work could result in savings of up to $5.3 million per year. Yes, some people are making money off these arrangements. And in theory, the U.S. government, which borrows money for close to nothing, could engage in such efforts for even cheaper if it were to finance the projects itself. But to paraphrase a former defense secretary: You go to war against energy inefficiency with the contracting procedures you have, not with the ones you wish you had. Correction, May 26, 2015: The article’s headlines originally misstated that the Defense Department switched to renewable energy at Rock Island Arsenal. Its upgrades will cut emissions and save energy, but not through renewable technology.